Shubham Inc, has obtained its place in the market as one of the most trusted, renowned, reliable and recommended manufacturer, supplier & exporter of Water Treatment Plants. Provided treatment plants are manufactured using high quality components and materials which leads to its durability, low maintenance, less servicing and good functioning. 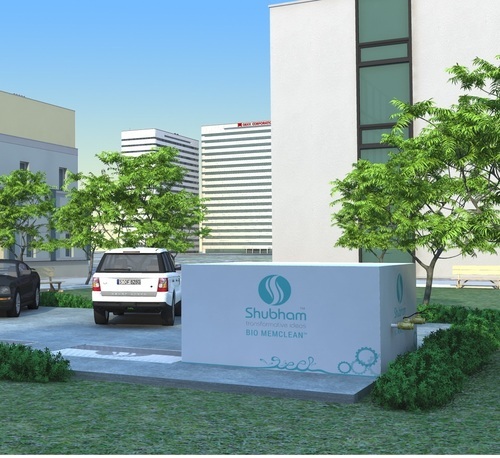 There are areas within the cities, towns and villages that are impossible to cover under centralized waste water treatment system, to offer perfect solution for the same, Shubham steps in this field. Shubham package sewage treatment plant type wastewater treatment system is compact, effective and economical for waste water treatment in decentralized manner. We offer a broad spectrum of packaged sewage treatment systems to handle domestic and industrial sewage originating from industrial residences, large commercial complexes, small and medium industries. The packaged units work on a media based biological degradation. The specifically developed media made from UV stabilized and chemically resistant propylene offers an ideal condition for growth of micro organisms to degrade the incoming organic contaminants. The use of media also reduces the aeration tank sizes substantially thereby reducing the footprint of Sewage Treatment plant. The process air required is provided by means of twin lobe type air blower which transfers air through rugged EPDM diffusers. The media also substantially reduces the sludge generation from these units. MBBR technology employs thousands of polyethylene biofilm carriers operating in mixed motion within an aerated waste water treatment basin. Each individual bio carrier increases productivity through providing protected surface area to support the growth of heterotrophic and autotrophic bacteria within its cells. It is this high-density population of bacteria that achieves high-rate bio degradation within the system, while also offering process reliability and ease of operation. This technology provides cost-effective treatment with minimal maintenance since MBBR processes self-maintain an optimum level of productive bio film. Additionally, the bio-film attached to the mobile bio carriers within the system automatically responds to load fluctuations. This entry was posted in Sewage Treatment Plant and tagged Baroda, Effluent Treatment Plant, Modular sewage treatment plant, sources of water, Supplier, Surat, Tannery Industries, Textile Industries, Waste Water Management, Waste Water Management Company, Wastewater Treatment, wastewater treatment system, Water Softening Systems, water sources, Water Treatment, water treatment Plant, Water Treatment Plant Manufacturers, Water Treatment PlantLeave a comment, Water Treatment Plants. Bookmark the permalink.